The accreditation procedure for representatives of the press wishing to attend the start of trial in the case of Jovica Stanišić and Franko Simatović, scheduled before the Mechanism for International Criminal Tribunals (MICT or Mechanism), for Tuesday 13 June 2017, at 11:30, in Courtroom I, is now open. Requests for accreditation will be accepted for the first day of the trial, covering the Prosecution opening statement. name and type of media outlet (TV, radio, newspaper, magazine, etc.). Other members of the public, including members of the diplomatic corps, wishing to attend the start of the trial should send an email to kralt.icty [at] un.org for more information on the procedure and space available. 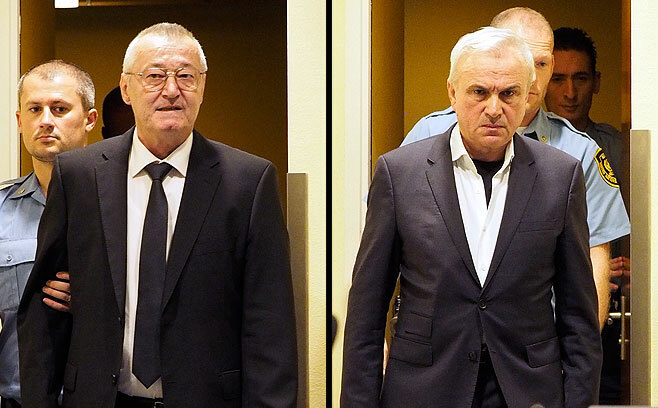 The operational indictment in the case of Jovica Stanišić and Franko Simatović was filed on 10 July 2008 before the International Criminal Tribunal for the former Yugoslavia (ICTY) and remains the relevant indictment for retrial at the Mechanism. The indictment alleges that Stanišić and Simatović, high-level officials of the Serbian State Security Service (DB), were co-perpetrators in a joint criminal enterprise (JCE) to forcibly and permanently remove the majority of non-Serbs from large areas in Croatia and Bosnia and Herzegovina (BiH) through the commission of the crimes of persecutions, murder, deportations and inhumane acts. According to the charges, Stanišić and Simatović, acting individually and/or in concert with other members of the JCE, participated in the JCE by forming, financing, supplying and supporting special units of the Serbian DB that were involved in the commission of crimes in Croatia and BiH between 1 August 1991 and 31 December 1995. On 30 May 2013, Trial Chamber I of the ICTY found, by majority, Stanišić and Simatović not responsible for committing the alleged crimes and acquitted both accused of all charges ordering their immediate release. The Prosecution filed a notice of appeal against the ICTY trial judgement on 28 June 2013. The ICTY Appeals Chamber on 15 December 2015 quashed the acquittals and ordered that Stanišić and Simatović be retried on all counts of the indictment pursuant to Rule 117(C) of the ICTY Rules of Procedure and Evidence. Both Accused appeared before the MICT on 18 December 2015 and entered not guilty pleas. The MICT has competence over any retrials deriving from ICTR or ICTY cases ordered on or after the commencement date of the respective branch of the Mechanism. This is the first retrial before the MICT. MICT External Relations Office at +31 (70) 512 5549 or email mict-press [at] un.org. Court proceedings can be followed on the Mechanism’s website with 30 minute delay.